LibX creates links on Amazon.com pages, allowing you to search the APU Library Catalog for books. 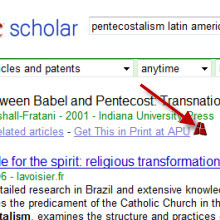 LibX creates links in Google Scholar results, allowing you to search the APU Libraries' collections for books and articles. The APU Libraries are pleased to announce the availability of LibX, a new research tool that can save you time and money by providing direct access to APU-owned books and articles from third-party web sites. LibX is an add-on for the Firefox and Internet Explorer browsers. Once installed, LibX recognizes ISBNs, ISSNs, and DOIs on the websites you visit, then creates special links (using an APU icon) to the items in the APU Libraries' collections. When LibX creates a link, you'll be able to access the book or article you need directly, or request it through Interlibrary Loan if it's not available in the APU Libraries. 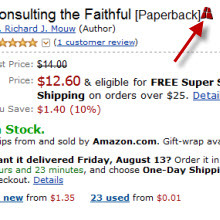 By using LibX instead of buying books and articles online, you can save time and money. LibX is easy to install and use. Once you do, you'll wonder how you ever did research without it! For more information, and to download LibX, visit http://libx.org/editions/download.php?edition=E9B29E98. Questions? Contact Kimberley Stephenson, APU's Web Services Librarian.